Seeing a Musical Instruments topic thread on a primitive skills forum inspired me to collect my instruments that I use with my outdoor school students and share them here. i hadn't realized that shell was a commonality amongst the instruments. At upper left there is a Nuttall's Cockle shell shaker with wild pea (some species of Lathyrus) seeds inside, covered with western red cedar bark. At upper right is a tubeworm casing that I found on the beach in Malibu. I plugged one end of it with deer hide glue. 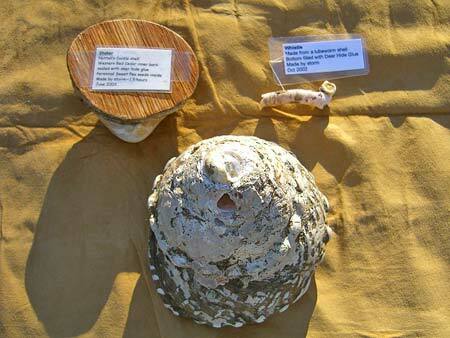 At bottom is a giant wavy turban snail shell horn (the shell is about as big as my hand, fingers included!) I also found in Malibu. Notice the hole that I drilled with a quartz-crystal-tipped hand drill. It works similarly to a conch shell horn (but more difficult). 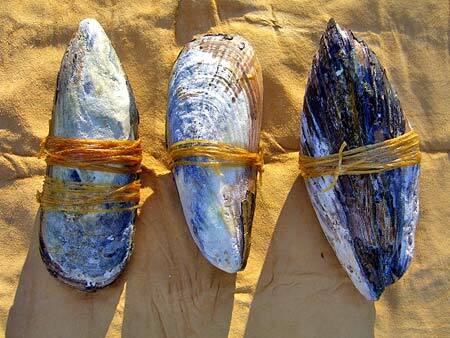 These are CA mussel shell shakers, bound with deer intestine and hide glue. The one on the left began to crack (presumably as it dried), so I doubled the intestine lashings. 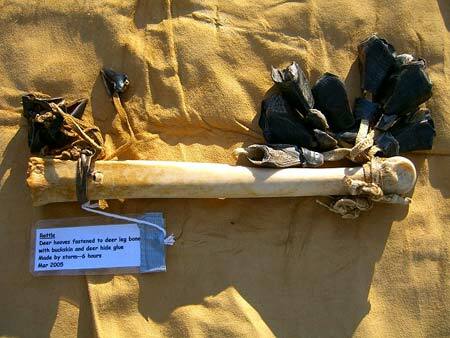 Deer hoof rattle. I collected the hooves from two deer in the temperate rainforests of the Olympic Peninsula of WA (I will end up there someday--best place I've encountered to live with and off the land). The tiny hooves to the left came from a starved fawn that I found on the shore of Lake Crescent (near Port Angeles). Along with some tecates (the CA clapper sticks, not the mexican beer), it is great fun to make music with the 5th and 6th graders who come to the outdoor school for a week.